A fun project to give new life for our once beloved head units. Car radios use 12V DC which means they can’t be plugged directly into the wall socket like every other hifi system. We either need a 12V DC adapter or a strong enough battery. As keeping a battery in the living room aestetichally un pleasing for most woman I would suggest that let’s go with the adapter. Adapters aren’t really hard to come by these days. For a couple of bucks there are plenty to choose from which are good enough to drive our system. For a basic system you don’t even need this one. I used to use an old 12V 2A adapter that was lying around and it was perfectly fine for normal use with 2 50w speakers attached to it. On max load there weren’t enough juice to run the system and it shut itself down though. I built a small box for the head unit only and connected it to the TV headphone out. This way everything that was on TV including the living room pc sound came to the head unit. 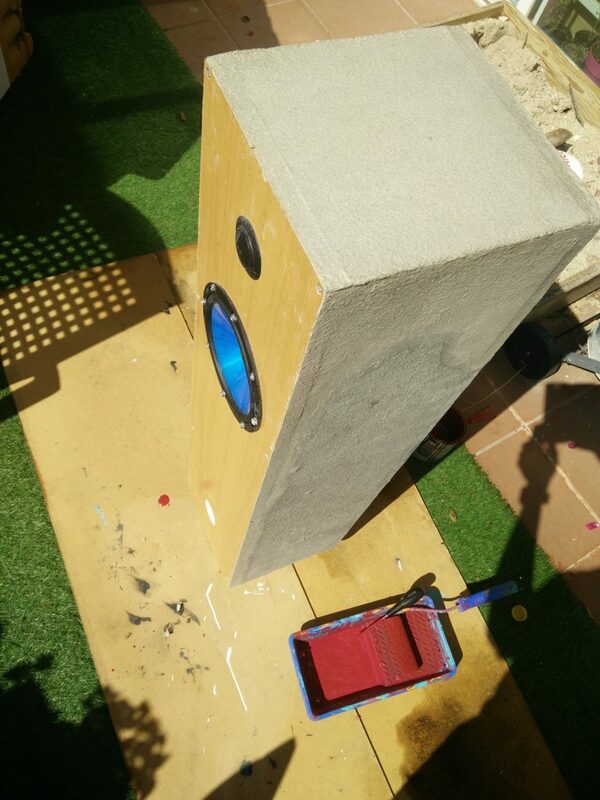 Building the speaker boxes was the biggest challenge of all. 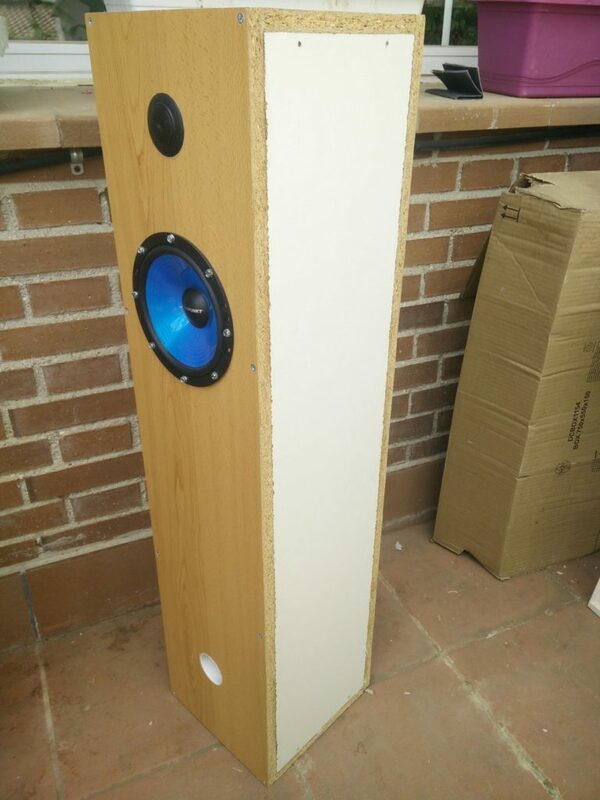 Speakers ment to be built in by enthusiasts come with parameters necessary for calculating box sizes. Unfortunately, speakers meant to pop into a car door aren’t in this category. We need to measure its parameters to calculate the box size for them. For speaker measurements there are several professional tools available for good money which we’ll worth investing if someone is building a plenty of boxes. Also there is the manual way of getting the numbers with a potentiometer and oscilloscope quite easily. This also means that you have to buy the equipment if you haven’t got them already. Luckily there is a third way of doing measurements thanks to the amazing limp software. This amazing little tool allows us to use the stereo output and microphone input on computers to get the Vas, Qts and Fs. Note: when calibrating the limp tool, disconnect the speaker otherwise it won’t be able to conduct the test. When we got these crucial parameters there are plenty of online tools to design the speaker box and calculate the panels size. My tool of choice was www.diyaudioandvideo.com First check if your speakers are fit for closed or ported enclosure. My blaupunkt speakers were good anywhere but the closed box would have been enormous. Plus I like the bass what ported boxes provide but the normal ported box gave me some negative numbers for some reason and I went for the butterbox b4 box. The most popular option for speakerboxes due to its density and relatively cheap price is the MDF board. I opted for 3/4 plywood now as I had that lying around but if I rebuild them I’ll go for pine as it looks awesome. After I finished the speaker boxes and enjoyed the setup for some time I realised some of the disadvantages of having a head unit without a remote control in the living room. It’s fine for gaming, or movies but it’s rather inconvenient for listening to music if you like to skip tracks often which I do sometimes. This was an excellent possibility to pi up the project. Also I was not entirely happy with the equalizer options either. I like music with deep bass but I prefer movies with clear sound. 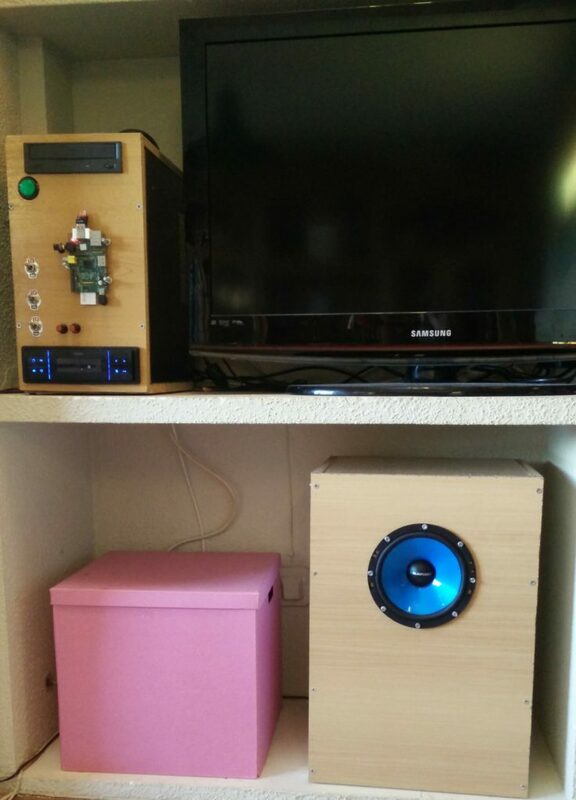 Unfortunately switching between the two was a rather inconvenient so I decided to add a Subwoofer to the system. I thought it’s a wise idea to upgrade the adapter too as I was going to drive the head unit, Subwoofer and the raspberry pi from the same power source. I needed a couple of more switches to be able to turn off everything individually and some cables to connect all together. For the box I again opted for the same plywood as I always have some around. The hardest part was to install the switches because the wood was too thick and I had to carve the wood out. Otherwise it’s a pretty simple board. The CD/DVD player is on the top with the pc power button right underneath. 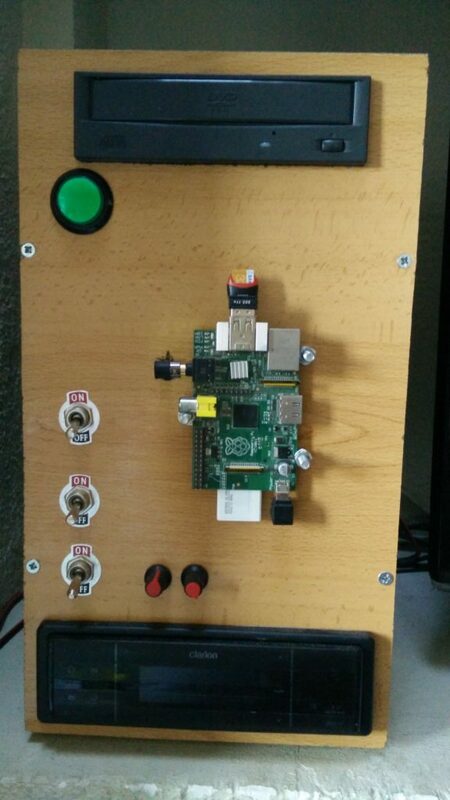 The three switches run down on the left hand side are the head unit, raspberry pi, and Subwoofer respectively. At the center next to the switches sits the raspberry on three M4 screws. Next to the Subwoofer switch there are the amplifier tone and volume knobs. This allows tuning the bass easily or switching it completely off with a flick. At the bottom of everything there is the head unit. The inside of the box has just enough room to house everything without the need of installing slimmed down equipments. The psu and cpu has low noise fans from noctua and make the pc operation almost dead silent. A lovely sandpaper needed to remove the excess silicone I used to fill the gaps when the box was assembled. Also this step was kind of necessary to help the paper mache sitck better to the surface. When sanding was done there was time to start bringing up the paper mache onto the surface. This could be done by anything even with bare hands. It needed roughly a day on a sunny terrace to dry out completely. The other took a couple of days as I had to take it inside for the night and the next days were rainy.